U.S. oil output has boomed since 2014 as drillers have increased their use of horizontal hydraulic fracturing, making the nation one of the world’s top three producers, as seen in BNEF’s JODI data LiveSheet (clients can access the LiveSheet here). Drillers have also gotten more efficient, extracting more oil from wells for less money. As a result, more wells are economic, or “in the money,” even though crude futures haven’t reached $75 a barrel since 2014. This evolution has changed the landscape of global oil markets and motivated BNEF’s analysis on basin-level break-even prices, or the cost required for an incremental well to remain cash-flow positive. BNEF estimates that just over half of the analyzed oil-producing counties are profitable based on current market prices and cash flows. Break-even prices range from $31.61 a barrel for the best Permian Midland wells to $188.25 for the weakest Permian Delaware wells. These prices are based on many factors, with IP rates the most important. The analysis shows Texas and North Dakota have some of the lowest break-evens in the market. In Texas, the Permian and Eagle Ford are the most economic, followed by the Bakken basin in North Dakota. 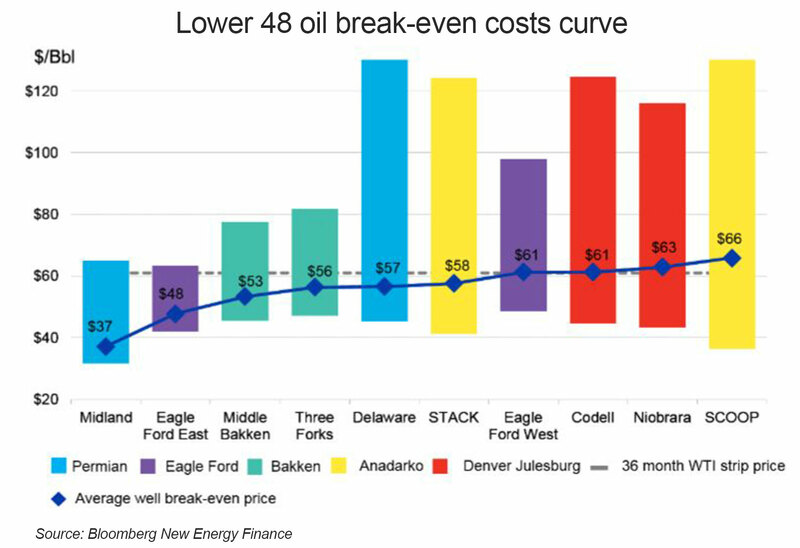 At the other end are the Anadarko basin in Oklahoma and the Denver Julesburg in Colorado, which have break-evens closest to current prices. A retreat in prices would probably cause a slowdown in drilling there. BNEF foresees challenges for U.S. producers. In the short term, OPEC may put more oil on the market, which would lower prices and cut into U.S. profits. In addition, the next drilling will be farther from “sweet spots,” or prime acreage, leading to lower IP rates and total output. Drillers have also been using more proppants recently to boost initial production. Proppants are sand or ceramics pumped into source rock to improve hydrocarbon flow. That higher IP rate tends to be followed by steeper declines. 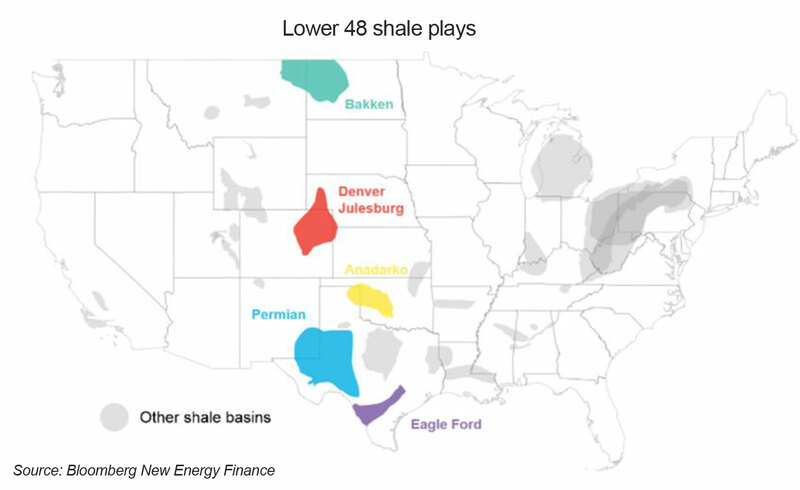 A combination of steep declines from wells using proppants, more drilling in less-prime areas, and increased global supply from OPEC may lead to a rough patch for U.S. producers, especially in the Anadarko and Denver Julesburg basins.